Here are 20 fun and educational Hanukkah Art Activities for your students in preschool through second grade. This is an easy and fun activity for 3’s and above. We make The Star of David ornaments using 6 popsicle sticks, glue, glitter, and ribbon. You take 3 sticks and glue them into a triangle and then do the same with the other 3 sticks. You then glue the one triangle on top of the other triangle in opposite directions. This makes the star. You then can decorate the star with glitter and attach a ribbon loop on the top of the star using glue. This is very easy and looks great on a tree. Arrange 4 poster boards together. by using a pencil draw a simple outlined menorah. Dip children’s hand into the different color paint. Print children’s handprint onto the menorah. Use a different color paint for every branch. Use orange paint for the flames. It looks really cute when done. Have all different dreidels available for use. Each child receives a plain sheet of paper cut in the shape of a dreidel. After dipping the little dreidels into the paint, spin them on the paper to make a really neat looking dreidel design. Hang from a string, it looks really nice! These make great Hanukkah art activities. As an art activity for Hanukkah, I mixed up a large batch of salt and alum modeling dough (found on this website). The children formed a narrow wide base and “built” a center “hill” for the Shamash candle. We took Hanukkah candles and made 4 holes on the left of the center and 4 holes on the right. We then made a center hole (which is higher, for the Shamash, or servant candle). We let this dry for a couple of days. The kids then painted their menorahs. We made Hanukkah menorah ornaments for our Christmas tree. We bought colored craft sticks and cut four in half for each child. Using thick paste (recipe found on this website), we glued 2 regular sized craft sticks so that they made a cross shape. One craft stick will be the base of the menorah, the other will be the Shamash candle (glue it so that it is a little longer on one end). Then glue 4 of the sticks that were cut in half on one side of the Shamash candle, and four on the other side. Let it dry. Then have children paint gold glitter glue to the tips of the craft stick “candles” to create a flame. The teacher then hot glues a ribbon loop to the back top of the Shamash candle. Prepare a piece of cardboard for each student. Drizzle white craft glue in the pattern of a menorah, dreidel or other Hanukkah symbol. Allow glue to dry. Have children cover cardboard with art brayer in the silver or gold paint. Then take construction paper (I use large sheet folded in half so the design is the outside of a card). Have the children rub on top of the construction paper with the painted design underneath. The design will be “printed” on the construction paper. 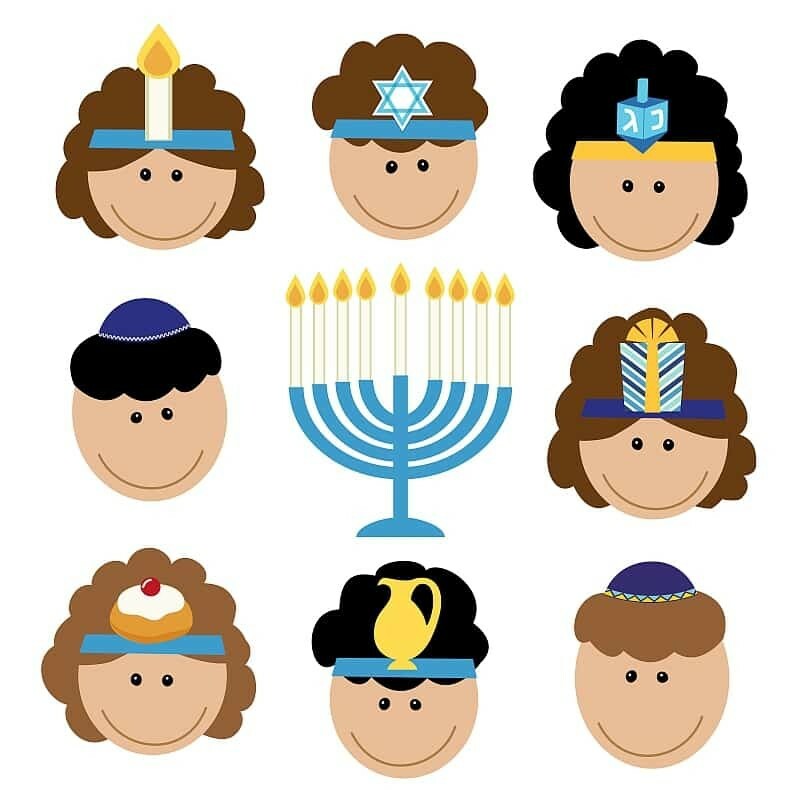 Wonderful Hanukkah Art Activities – menorah. 1. Have children work with a partner. 2. Give them clay (one that will air dry). Let them pound, throw, knead and flatten. 3. Once flattened, give the children Popsicle sticks. Let the children take turns tracing or carving out each other’s hands. (2 for every child) 4. Overlap thumbs and press. Now stand up so that fingers are facing the ceiling. 5. Give the children a pencil and show them how to make a hole in the top of each finger. 6. Place small birthday candle holders (found in supermarkets) in each of the openings on top of the clay fingers. One for every night of Hanukkah and the one in the thumbs is called the Shamash. 7. If they want, let them paint their menorah. 8. Wrap with wrapping paper they have created. Wrapping paper: Give the children large sheets of tissue paper. Provide them with cookie cutter shapes and trays of paint. Let the children stamp shapes onto tissue paper. Let dry. NOTE: Cookie cutters work better at preserving tissue paper than sponges. It will not become saturated with paint. Dreidel Sun Catcher Cut 2 7″x7″ of clear contact paper, remove the backing from one side. Place blue and gold icicles then place another piece on, cut in shape of a dreidel punch hole at the top and hang in the sun. Chanukah menorah tissue spray art mural. Cover a wall with large white butcher paper. Cover the floor with some towels. Put a large laminated menorah on the wall at child’s height. Glue stick tissue paper candles above the laminated menorah. Children will spray water in spray bottles on the menorah/candles and watch the colors run. Children can add more and more tissue candles on the wet paper (it will stick). Marshmallow Menorah Materials needed: Strips of cardstock (approx: 11 in long),10 large marshmallows, pretzel sticks or birthday candles, glue Children glue 9 large marshmallows in a line on the cardstock – glue the 10th one on top of the middle marshmallow. Place candles or pretzel sticks inside each marshmallow – because you have used glue – the project is not edible – you may want to have extra marshmallows for those who would like to snack.